I`m Marie, a normal grey cockatiel. 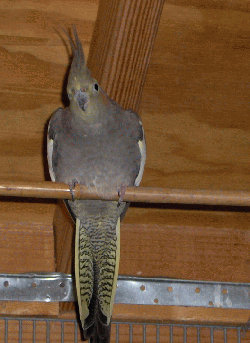 I was rescued from a private aviary in Santa Cruz along with Arnold, Jonesy, and Lars. The owner of this aviary was moving and, since the aviary was attached to his house, that meant that the inhabitants thereof had to either stay where we were or find new homes. Since the buyer of the home was not interested in adopting us, we ended up at a shelter. As happens so often, the good people at this shelter weren`t ready to take in a bunch of birds, so, in our best interests, they called Mickaboo. You may have guessed that the name "Mickaboo Companion Bird Rescue" implies that they rescue and adopt mostly pet birds. This is true, but, lucky for us, they also take in some aviary birds! We are now in a fresh new aviary in the South Bay, and ready to find a forever home! Thanks Mickaboo!